Hundreds of young Hamiltonians and their families are enjoying cycling – some for the first time – thanks to Mike’s Bikes, a program of the Michael Chamberlain Fund at HCF. An active cyclist with an adventurous spirit, Mike Chamberlain loved to ride whether on Hamilton’s roads and trails or on biking expeditions around the world. Family members proudly display their Mike’s Bikes, received with helmets and locks. The fund, established in Mike’s memory by his family ‑ Mark, Debbie and Kristen ‑ brings to life his dream of making Hamilton a more cycle-friendly city by improving access to biking and promoting cycling as a healthy, safe activity. Since the fund was established, two annual ‘Bike for Mike’ fundraisers have worked toward Mike’s vision. This year, more than 300 riders raised the funds to buy bikes, complete with locks and helmets. A program called Mike’s Bikes has been created to distribute the bikes to children in partnership with community schools. 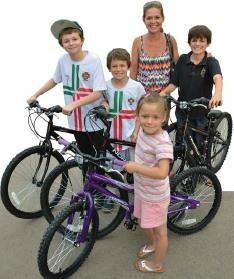 To help meet the program’s goal of ensuring entire families of the school children also have a bike, the Chamberlain family, friends and local bike shops collect used bicycles, refurbish them and distribute them with the new bikes. Holy Name of Jesus is the first school to participate in Mike’s Bikes, through which 100 bikes went to children and their families. The children also engage in ongoing safety, maintenance and riding programs, and when they outgrow the bike, they can donate it or exchange it for a new one so others can enjoy owning a bike. “This is just the beginning,” says Debbie. “Our goal is to involve as many schools as possible until everyone in Hamilton has a bike and the community truly embraces cycling.